For some people the idea of critiquing other people’s work is completely appealing, to others it can be a bit too much pressure. There are people who are naturally inclined to be critics or judges, but in a more professional capacity. 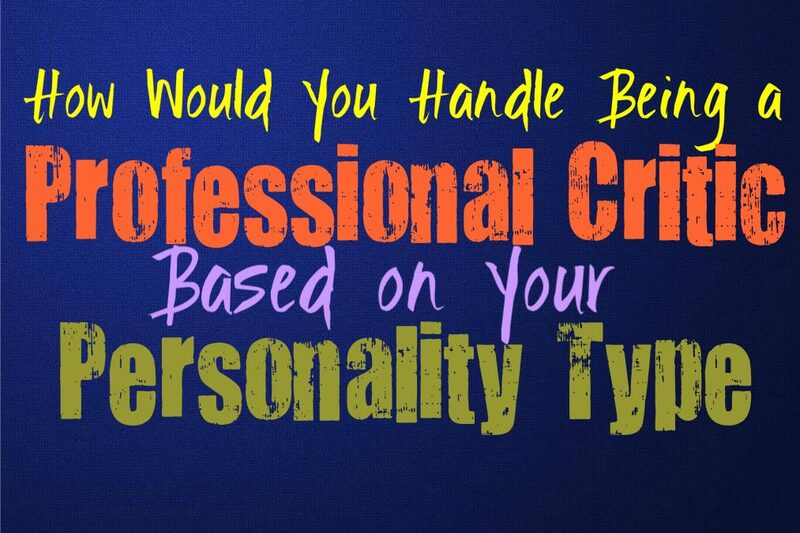 Here is how you would handle being a professional critic, based on your personality type. INFJs might not enjoy the idea of being an actual critic, at least not if they can connect with the people they are judging. They do have a lot of opinions and this can help them critique work, especially things they are personally passionate about. INFJs might consider themselves capable of critiquing certain things, but then part of them might feel bad if they are too harsh towards someone. They likely will be the type of critic who delivers a very informative and honest review, but with a certain level of tact. ENFJs can often be natural critics, especially with things they are passionate about. They can often assess the work and try to be as honest and upfront as possible. At the same time ENFJs don’t want to be too hurtful, so they aren’t likely to be harsh without reasoning behind it. They would rather be sensitive to others, and so there are some moments where being a critic can actually be a bit hard on them. They will enjoy being able to analyze the results though, and enjoy being someone that others come to for an opinion. The one thing that INFPs might enjoy about being a critic, is feeling like they are the person everyone turns to for answers. They like feeling like they are important in this way, especially when it is tied to something they are personally passionate about. Being the sort of master of this subject or work, is something which would bring the INFP a sense of pride and accomplishment. At the same time, they can feel a bit guilty if they need to judge someone harshly, and will not want to hurt them too much with their critique. ENFPs might enjoy being able to critique certain work, especially with things they are excited about. They won’t mind being a critic, and can often disconnect a bit in order to be accurate about the situation. They want to be able to give the best reviews to people who deserve it, and don’t like when someone is rewarded when they haven’t done a good enough job to really earn this. ENFPs can often make good critics, especially if they feel proud of their knowledge on the subject they are judging. INTJs often make for natural critics, since they value being accurate and informative. They might even enjoy being in a position where they can judge something. INTJs will use their minds and try to analyze the work in front of them, before making their final decisions and reviews. They might be a bit direct and tactless sometimes, but this makes them more popular as critics, not less. Since they are unafraid to be honest and even a bit harsh, people often respond very well to this. ENTJs can make for excellent critics, since they aren’t afraid to tell the truth. While some people are nervous to be too harsh, this causes them to avoid really being upfront with their critique of something. ENTJs are not like this at all, and instead value being completely transparent with their critiques. If they are judging something they take this responsibility seriously, and want to give it a completely honest and sincere analysis and final critique. INTPs might feel like being a critic is a lot of pressure, but that doesn’t mean they aren’t capable of it.They are analytical people who can often observe and do their best to see where any flaws might be in the work or creation. While they are good at seeing all of the angles the INTP can sometimes approach it from too far outside of what others are expecting. Sometimes they see things in a way that other do not, and this makes it difficult for them to be critics in the way that people expect. ENTPs do enjoy analyzing information and sometimes they like feeling like the person others come to for answers. They can enjoy being the person who critiques something and tries to see it from a different angle. ENTPs are not often the critics who judge things the way people expect, but this can give them an edge. They don’t simply judge based on what others feel should be done, instead they use their own minds and creative ideas to really critique something. ISTJs can definitely be critics, since they approach things from a factual point of view. They are also perfectionists so they can see where all of the flaws in something are. While ISTJs might be good critics, they can be viewed as a bit too direct sometimes. It might seem a bit hurtful, but their intentions are just to be straightforward and even helpful with their reviews. ISTJs believe that people should earn their rewards, and so if their work isn’t up to par it should be known. While ESTJs are direct and honest people, they might not find themselves all that interested in being a professional critic. They are certainly known to voice their opinions openly, and can give an honest review when they see something that just doesn’t seem worthy of reward. At the same time ESTJs find themselves more interested in doing things themselves rather than just judging what someone else has done. ISFJs are not likely to enjoy being critics, simply because they don’t like being too harsh. They might hold back and try to phrase things in a nice manner to avoid hurting someone’s feelings. For the ISFJ being a critic can feel like too critical a job for their taste. They prefer to be kind and gentle to people, and don’t want to do or say anything which might hurt anyone else. ISFJs are capable of reviewing things or being honest about it, but they like to give their opinion with a dash of sugar. ESFJs might enjoy being able to critique something, since it feels good to be the person others turn to for answers. For the ESFJ the best part of this job is being the authority on something they value and are passionate about. At the same time they will struggle with having to be harsh towards others, and sometimes want to avoid being too hurtful with their critiques. The ESFJ critic is likely to be as honest as they can, without actually saying anything that might hurt someone too deeply. ISTPs are good at being able to honestly critique something, especially when it is a subject they know very well. Their critiques will likely be honest and to the point, and might not drag on like some peoples. They won’t mind a job like this, since they aren’t afraid of being upfront and telling the truth about something. It’s not that ISTPs don’t care about others feelings, they just believe that being factual is more important. ESTPs can be rather direct and factual people, and so they find themselves capable of being critics because of this. They aren’t afraid of hurting someone’s feelings, especially not when they are judging their work. ESTPs would rather be direct and honest, instead of having to hide behind their desire to please others. If they are a professional critic then they will take this very seriously and will want to help people improve by being truthful. ISFPs rarely find themselves wanting to be critics professionally, simply because this can feel a bit hurtful. They don’t like saying or doing anything that might leave someone feelings like they are less than valuable. ISFPs are often artistic people, and while they might critique something in their minds, they don’t necessarily want to do this openly where others can be affected by their words. ESFPs might enjoy the idea of being a critic, but at the same time they don’t really like hurting people. They would rather let others work on their art and themselves without having someone constantly judging them for it. While ESFPs might be capable of seeing things from an honest point of view, having to deliver this in a way that could upset others, isn’t really something they are drawn to naturally.